Now, I’m not the most spontaneous road trip-py person in the world but if I were, then after looking at this traffic map I’d be itching to go somewhere right about now… As for planned road trips I am excited about my first venture up to Mt. Wilson tomorrow. I’m doing a real road trip… on my bike. If you’re on the Westside and looking to travel a short distance here are some local bike ride tours you can take today. Also today is Field Trip Day. See? 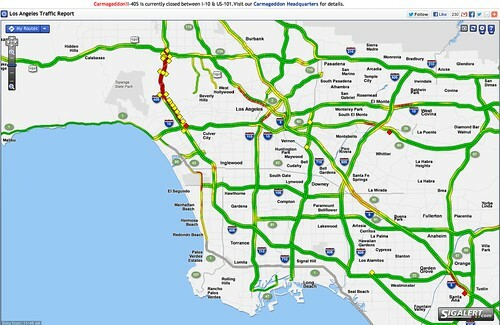 No reason to stay indoors just because a part of one freeway is closed. Get out there and enjoy your weekend. 10/01/12 Carmageddon II update: The effort was a success! This entry was posted on Saturday, September 29th, 2012 at 12:23 pm	and tagged with biking, biking trails, carmageddon, los angeles and posted in Uncategorized. You can follow any responses to this entry through the RSS 2.0 feed.